Google Chromecast is the most inexpensive way to stream apps like Netflix and YouTube to any modern TV, but there's still no way to mirror an entire Android device to the big screen. That could change thanks to the single developer behind the new AllCast app. Koushik Dutta demonstrated a build of his free app that mirrored Flappy Bird to an HDTV. This unreleased version bests the current AllCast Android app, which can only stream photos, videos and music to a TV through a Chromecast or devices like Roku 3, Apple TV and Xbox One. Mirroring an entire Android smartphone or tablet would help put Google's media streaming stick on par with Apple's AirPlay technology in the Apple TV vs Chromecast comparison. Official Chromecast mirroring to come? 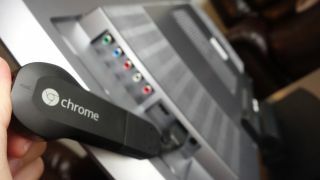 It's surprising that Google has left Chromecast mirroring up to developers who now have access to the Google Cast SDK, but it doesn't rule out the company's involvement in the future. Dutta said he did some poking around to see how far along Google was with a possible Chromecast mirroring solution. "There's plenty of evidence that there's some (possibly half baked) solution in the Play Services APK and it is not totally disabled," he said on his Google+ page. "I'm wondering if there's another magic protocol that is about to be added to the Chromecast firmware itself to support this directly. That would be ideal." Dutta's AllCast solution to stream photo and video content from an Android device to Chromecast is noble, but even he admits that the sometimes buggy feature is in beta. It'd be nice to have Google officially support Chromecast mirroring. Until then, it's best to check out AllCast.